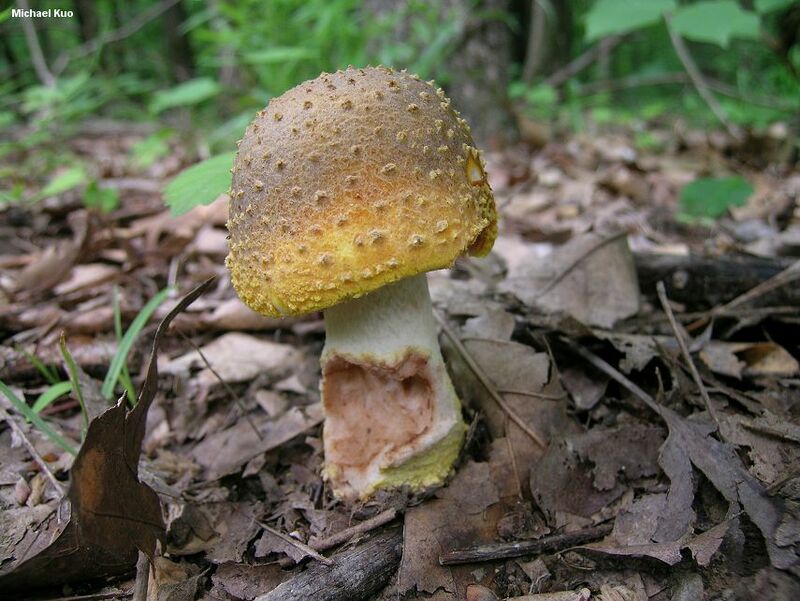 Here is a beautiful species of Amanita, fairly easily distinguished by its yellow cap, its yellow warts, the fragile yellow volval remnants found at the base of its stem, and its tendency to bruise slowly reddish to reddish brown, especially in the stem. 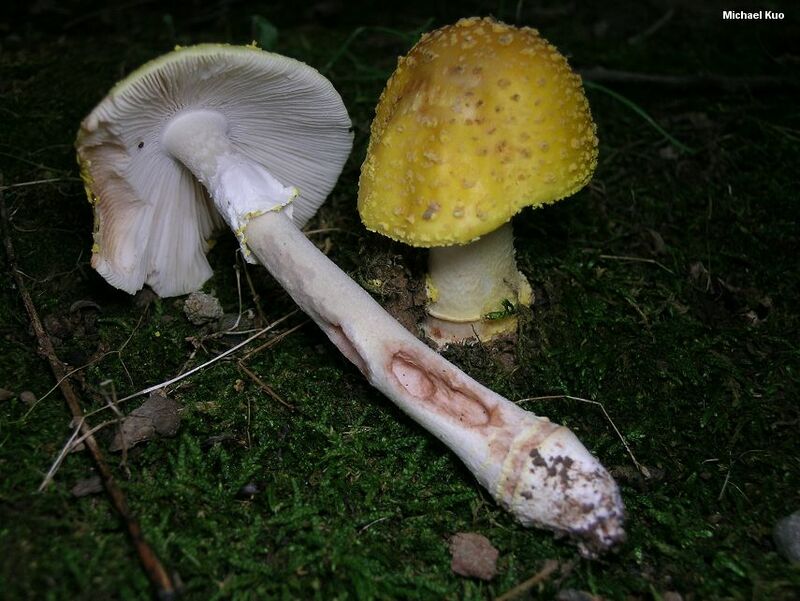 Amanita rubescens is very similar, and also bruises reddish, but its cap is not yellow beneath the warts--and the warts themselves fade quickly from yellow to buff or pale tan. Should we call this mushroom "Amanita flavorubens?" Amanita expert Rod Tulloss does so at his web site, and Jenkins (1986) suspected "the possibility" in his treatment of the genus in North America. The name flavorubens was designated in 1856 by Montagne, who was describing a species from Ohio; the name flavorubescens comes from Atkinson in 1902, describing a species from New York. The two descriptions are indeed similar and plausibly represent the same morphological species. Absent any other factors, this would mean that the older name, flavorubens, should take precedence. 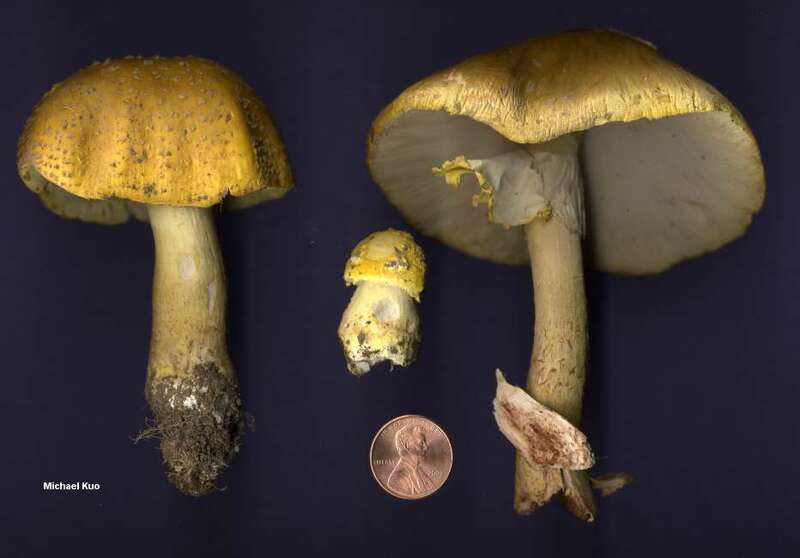 However, MycoBank, one of two online databases widely used for mycological taxonomic records, currently indicates that Montagne's name was actually invalid, since his "Agaricus flavorubens" represented a name already designated for a different species by Persoon in 1828. To confuse things further, MycoBank does not have any records for Persoon's supposed use of the name; neither does the other widely used database, Index Fungorum. Persoon's publication is about 300 pages long, is written in Latin, and includes no index; you are welcome to search for the epithet flavorubens if you really need this issue resolved right now. But I think this is a mess that should be sorted out and thoroughly reasoned in a peer-reviewed taxonomic publication, rather than on web sites and in databases. Meanwhile the conservative course is to keep using the epithet flavorubescens since it is widely known, and since at least one important online database suggests the base-name for flavorubens is invalid. Ecology: Mycorrhizal with hardwoods (especially oaks), but sometimes reported under conifers; occasionally found in urban habitats when trees are near; growing alone, scattered, or gregariously; spring through fall; fairly widely distributed east of the Rocky Mountains, but also known from Arizona and central Mexico. Cap: 4.5-14 cm; convex, becoming broadly convex or nearly flat; sticky at first or when wet; bright yellow to yellow-brown (often brighter yellow toward the margin, especially when young); sometimes bruising slowly reddish; adorned with conspicuous, woolly to felty, yellow warts; bald underneath the warts; the margin not lined, or only faintly lined at maturity. 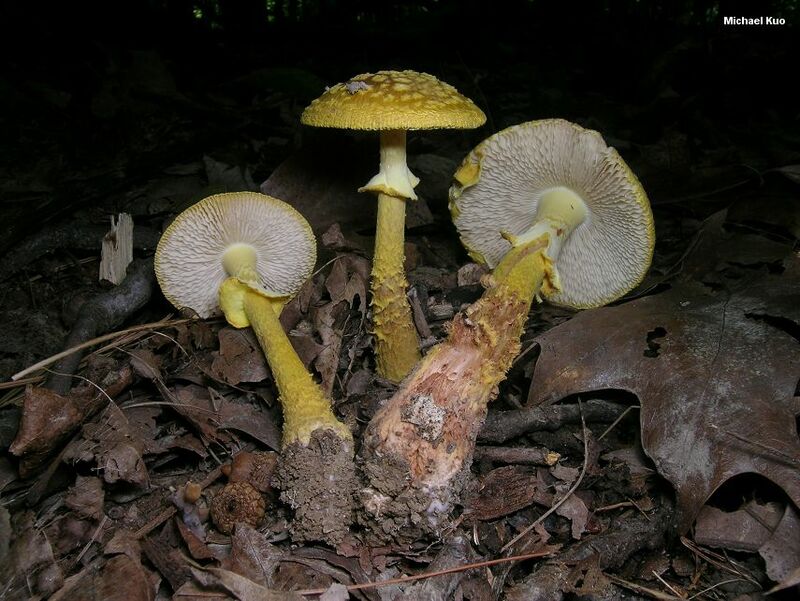 Gills: Free from the stem or slightly attached to it; white; close or crowded; short-gills frequent. 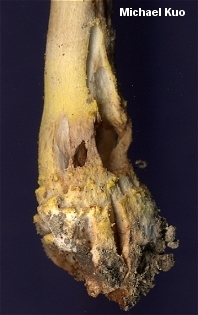 Stem: 6-15 cm long; 0.5-1.5 cm thick; more or less equal above a slightly swollen base; bald, or somewhat shaggy below the ring; pale yellow to whitish, bruising and staining slowly reddish; the ring persistent, skirtlike, and whitish to yellowish (sometimes featuring yellow stains at the edges); base often adorned with yellow volval remnants that break up and become indistinct, leaving yellow remnants on the soil. Flesh: White to yellowish throughout; staining slowly reddish, especially in the base of the stem. 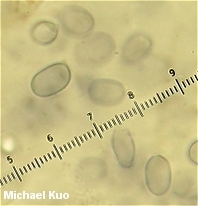 Microscopic Features: Spores 6-11 x 4.5-7 µ; smooth; ellipsoid; amyloid. Basidia without clamps; 4-spored. Pileipellis an ixocutis of hyphae 2-6 µ wide. Lamellar trama bilateral; subhymenium ramose. REFERENCES: Atkinson, 1902. (Saccardo, 1905; Kauffman, 1918; Smith, Smith & Weber, 1979; Weber & Smith, 1985; Jenkins, 1986; Phillips, 1991/2005; Lincoff, 1992; Metzler & Metzler, 1992; Roody, 2003; Tulloss, 2003; McNeil, 2006; Miller & Miller, 2006; Binion et al., 2008; Tulloss, 2013.) Herb. Kuo 06239507, 08300210, 05280703, 06221013.